Drawings in an animation are not always exposed on a single frame, they are often exposed for more than one frame. The most common exposure of a drawing is two frames. In the industry, this type of exposure is known as animation in double frames. A drawing can also be exposed for three, four, five cells and so on. To prevent mistakes and to save time, the Xsheet lets you hold your cells automatically as you type. The Xsheet’s Set Exposure option allows you to choose how many frames you want to hold your exposure for. • This option is only available in the Xsheet view. 1. In the Xsheet View menu, select Exposure > Hold 2 Cells. 2. Right-click the Xsheet view and select Exposure > Set Exposure To > Set Exposure to 1, 2, 3, or Set Exposure. 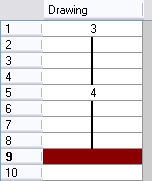 In the Harmony Xsheet, select Option > Hold 2 Cells. 3. Type a value or drawing name in the cell. ‣ Press [Enter/Return] to move on to the next cell. ‣ Press [Esc] to quit the typing mode. ‣ If you selected Set Exposure, the Set Exposure dialog box opens. You can hold as many cells as needed.